Can you spell C-H-A-M-P-I-O-N? 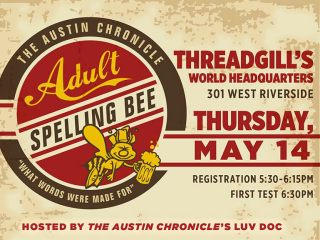 Then test your chops during The Austin Chronicle's annual Adult Spelling Bee. Swing by Threadgill's for an evening of letter, words and requests of "Can I have the definition, please?" Admission is free to watch, but there is a $5 participant donation that goes towards Austin Public Library. $5 for participants; Admission is free to watch.